The AEMP (Association of Equipment Management Professionals) API for use with the TeMeDa telematics solution. A collection of RESTful JSON-based operations for use with the TeMeDa telematics solution. The TeMeDa API Portal is also home to the AT&T Equipment and Machinery Solution API...a collection of RESTful JSON-based operations for use with the AT&T EAMS telematics/IoT solution. 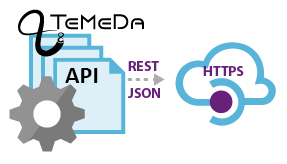 The TeMeDa Push Service API is a real-time data interface based on industry standard JSON and HTTP web operations. This interface is being offered to customers and service providers who intend to integrate their systems with TeMeDa and wish to receive real-time telemetry data updates as they occur within the TeMeDa telematics system. Customers are required to create a HTTP/JSON listener in order to receive data. Please contact TeMeDa to setup the PUSH Service API.